One of the great things about running is that it’s an excuse to visit places you’ve always wanted to go but you’d just never got round to. 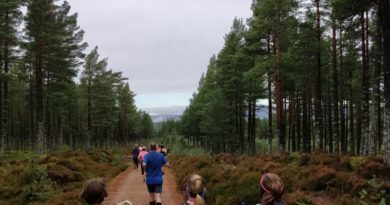 One of the earliest race bookings we made in the Gin Runners adventure was The Ardbeg Islay Half Marathon, mostly because it would give us an excuse to visit the Botanist Gin distillery. After a relaxing drive up to Kintyre in Mabel we headed to Kennacraig for our first high seas adventure. There were a few other running type people on the boat, so at least we knew we were hiding in generally the right direction. 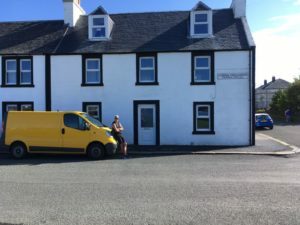 By the time we arrived on Islay and found our home for the weekend (a whole 2 minutes from the ferry) it was dark so we couldn’t really see much, which made the view from our bedroom window the next morning an extremely nice surprise. Well the beach, boats and sea was a nice surprise, but the bloody big, black clouds were a bit worrying. Scotland had been bathing in warm, sunny weather for weeks, surely it wasn’t going to rain now !!! With the weather looking increasingly worrying we drove from Port Ellen to Bowmore where the race started. Along the way we passed the mile markers for the Half, which strangely always seem so far apart when you’re driving. Sometimes it’s better not to know these things, because it meant the last 4-5 miles or so were a long, straight and mostly uphill drag. We arrived and checked in before joining the throng of runners milling about trying to decide if they needed a last minute toilet break. The start / finish line was at the bottom of a bloody big hill with an impressive church at the top which we were already looking forward to running down in 13 miles time, but were fervently hoping we didn’t have to run up at the start. Bang on time the race set off and, to our relief, we didn’t have to go up the bloody big hill. Instead we turned off to the right and did a sort of dog leg that was still a hill of the up variety but not as steep as t’other way. As we left the town and headed out onto the peat moor, bog, whatever it’s called the inevitable happened and the heavens opened. I’m not talking a bit of rain here, or even monsoon conditions; this was rain of biblical proportions. The route is basically a big triangle and all the way along the second side it pissed down. On we plodded, or rather squelched, and doffed our soggy caps to the locals manning the water stations and the photographer who were braving the deluge on our behalf. Or maybe as they’re local they just considered it a bit damp. The roads weren’t closed to traffic (not that there was much) but given the big puddles that had formed every time a car went either way we got splashed, but fortunately by this point we were already as wet as it was possible to be so we just shrugged it off and wondered if anyone had an Ark we could borrow.. This starting to read like a big whine abut the weather… but that’s just about all we did for about 8 miles. This was turning into something not enjoyable at all, but as Billy Connoly says, if you don’t like the Scottish weather give it a minute and it’ll change. (let’s not get into his “there’s no such thing as bad weather, just the wrong clothes”… shorts and a T-shirt are emphatically the wrong clothes). As we got towards the second angle in the Islay triangle the rain stopped and the long soggy drag up hill gave way to a long sweeping drag downhill. As we ran down this we looked at each other and smiled a damp smile. OK, it had been horrible up to now but this bit was BRILLIANT. We’d supported each other through the first part of the race plodding along side by side but as we turned onto the main road again to compete the triangle Bex took a look at the long, uphill drag we’d driven up earlier and said something along the lines of “off you go darling” (I think there may have been more swearing). I can’t think why she didn’t want my cheery “almost there, just keep going” jollying her along for the last 3 miles!! Suitably encouraged to go.. just go.. I took off looking for people to overtake. 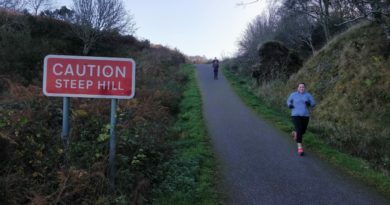 We both knew there was a big downhill bit to the finish, but neither of us realised how much uphill there was in the last couple of miles. Eventually I got to the town and saw the long awaited downhill finish ahead of me. 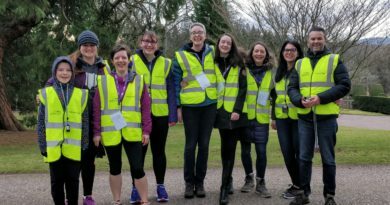 Unfortunately it was a bit busy with holidaymakers and traffic (and runners returning after finishing the race) so I had the option of dodging tourists and pushchairs on the pavement or dicing with the traffic on the road. In the end I chose the latter and apart from a minor collision with a transit van as I tried to chase down the chap in front I made it down to the finish in one piece and then, having collected my medal, I headed back up the hill to cheer Bex on. Then it was definitely time to head back to Mabel for a dry off and a change of clothes. Sandwiches and LOTS of prizes. 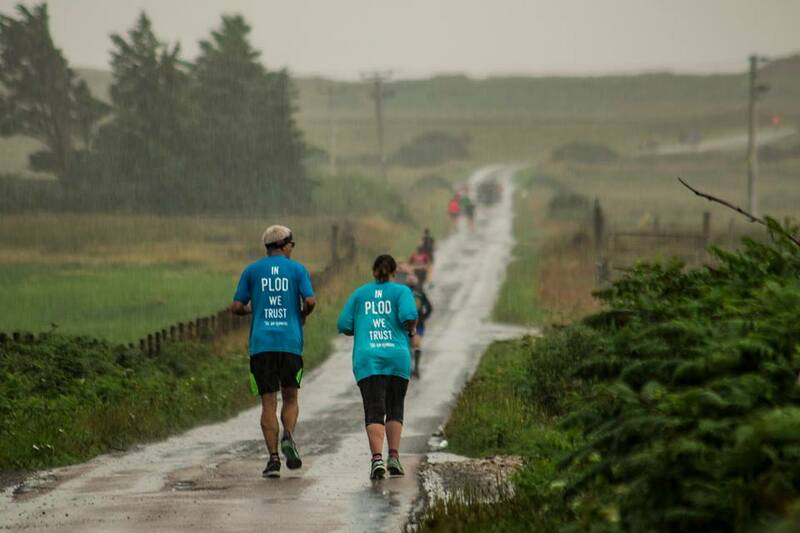 The Islay Half is one of those community events, and the community did us proud in the hall afterwards. Drinks and sandwiches were on hand as the locals went out of their way to be nice to these strange people who had come to run round their island in the rain. The prize giving was next, and there were a lot of prizes, many of them of the liquid variety from event sponsors the Ardbeg distillery. At some events there’s a one prize per competitor rule but not here and some folk went away with enough booze to stock an off-license. We didn’t mind, we don’t like whisky. The miniature for all the competitors who’d come from overseas was a nice touch, as was the prize for our friend Rebecca. If nothing else it meant everyone in the room knew she’d finished last. 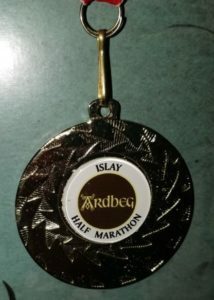 The Islay Half had been a fine event, well worth doing and one which even the crappy weather couldn’t spoil completely. That wasn’t the end of our running adventures on the island though. The next day dawned bright and sunny so we decided to go for a quick trot on the awesome cycle path that goes from Port Ellen to Ardbeg. This was one of those “Isn’t running great after all” runs, with the added bonus that it took Bex over 100 miles for the month. Theres of the day was spent touristing on this amazing, beautiful island with, of course, a visit to the Botanist Gin distillery.